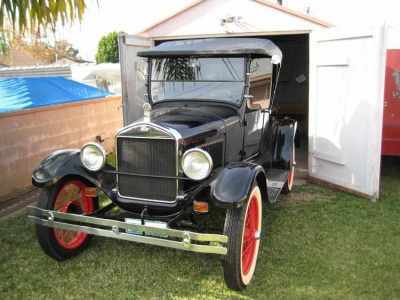 Model T Ford Forum: Does anyone know this car from So. Cal. Does anyone know this car from So. Cal. Model T Ford Forum: Forum 2014: Does anyone know this car from So. Cal. I would like to get any info about this car. I ended up with it and would like to get as much info as I can good or bad. Hopefully good. Thank you very much. Nice looking 1926-27 roadster/runabout. IF you know who previously owned it or what major city it was previously used in, that would help folks also. Southern California is a lot larger than LA or San Diego etc. The previous owner is often listed on the title. Also are there any special features about the car? Ruckstel two speed rear axle? Overhead cylinder head? And please verify that the fenders and body are both black and not some other dark color. And a slightly different question. Is this your first T or are you already familiar with them? If you are new to Ts you can learn things first hand (that can be expensive) or you can supplement the first hand experience by reading and learning from other's experience. Welcome to the forum and I'm sure some folks will be able to assist you. You say "I ended up with it" Did you ask the person from whom you bought it? That looks like a 26-27 Roadster in very good condition, at least the body looks good and the wire spoke wheels and rims are worth about $1,500 alone. Does the car say "made in Canada" on either the radiator shell or the engine or the running boards? I knew of a car made in Canada which was owned by a club member in Ramona Ca. He passed away about 15 years ago, and I don't know what happened to his car. Anyway, the body style is very common, so I wouldn't know any more about the car. Thanks. I am new to this forum. This is my third T and I like it best of all. It is all black. A great paint job but poor prep work as the paint tends to flack off in spots. 2 speed rear end, 12 volt, alt. .009 distributor, juice brakes on rear only. I put new white walls, tubes, flaps, ect. on it, VERY expensive, The engine and trans are in the shop for a o/h right now. I got the car from Bob Keller in Upland and he got it as part of an estate sale he had to take the car as part of a lot to get other pieces he wanted. ( after I got the car i found out he is an old friend of my dad Myron Lay ) Funny story. Nice car, hope you got it for a lot less then that asking price. Scott -- Does Bob Keller remember who did the estate sale? Where it was held? Who it was done for? Those could be some good clues. Note also the various adds said mechanical brakes or 1927 or 1926 it probably is one or the other. Some additional information and photos could help. Thanks very much. Yes I got the car for a very good price. I guess Bob wanted the trailer. Bob is a very great guy and we talked for hours about old cars.